Davros: If I were you, I’d be dead. Davros: You are soft, like all Time Lords. You prefer to stand and watch. Action requires courage; something you lack. Captured in a time corridor, the Doctor and his companions are forced to land on 20th century Earth, diverted by the Doctor’s oldest enemy – the Daleks. It is here the true purpose of the time corridor becomes apparent: after ninety years of imprisonment, Davros, the ruthless creator of the Daleks, is to be liberated to assist in the resurrection of his army. Even the Daleks do not foresee the poisonous threat of their creator. Indeed, who would suspect Davros of wanting to destroy his own Daleks? Only the Doctor knows the truth. Will he descend to Davros’ level of evil to stop him? 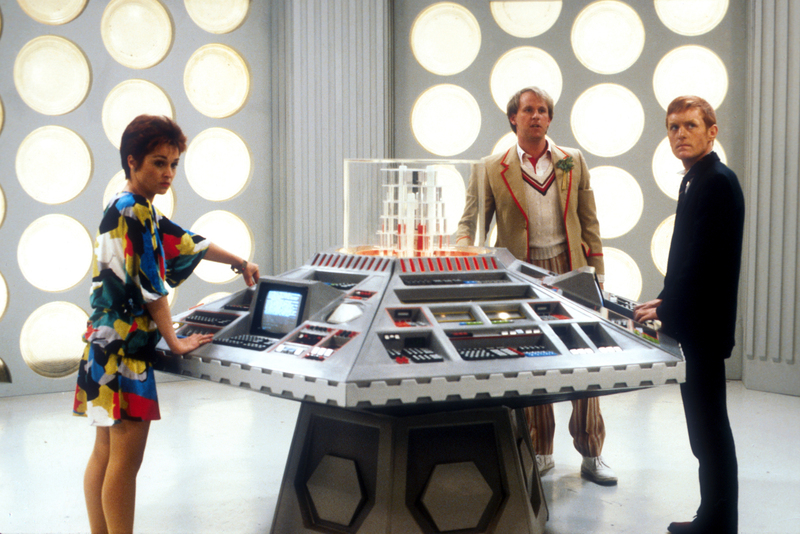 Resurrection of The Daleks marks the return of the Daleks after an absence of five years. The Daleks returned at the perfect time; which is the middle of Doctor Who’s darkest and most brooding season seen at the time. Even compared to the great horror classics of the 70s, such as Pyramids of Mars and The Talons of Weng Chiang, Resurrection stands as possibly the most gruesome and gory with a body count few other Doctor Who stories possess. The story begins with one of the darkest openings you are likely to see in an episode of Who, a bunch of time travellers arrive in 1980s London only for them to be shot down by Dalek mercenaries dressed as Policeman. Whilst there, they shoot down an innocent bystander before beaming back to the Dalek ship. The grimness of this opening is just the beginning as the story gets darker and darker. Even though the bodies pile up throughout the story, it is the opening that stays with the viewer due to its true grit and bleakness. The Doctor soon arrives on the scene having been transported there by the Dalek time tunnel. Due to the 1984 winter Olympics the story was originally transmitted in two parts. However, watching it in its intended four part format on DVD proves what may look like messy writing isn’t. True the Dalek’s plans are convoluted but the Daleks have never been exactly bullet point strategists. After talking to the local bomb disposal squad, the Timelord soon realises that the Daleks are involved. Arriving on The Dalek ship, he confronts the creator of the Daleks, Davros. A cat and mouse game ensues between The Doctor, Davros and his creations leading to a spectacular and sinister finale in which the Dalek spaceship is blown up. Both The Water of Mars and A Town Called Mercy owe a lot to this story. It has the moral depth of Town and also The Doctor going overboard as similarly seen in Mars. Peter Davison is fantastic in this story. Davison brilliantly shows the moral struggle that The Doctor is facing. Davison portrays The Doctor’s moral dilemma particularly well in the scene in which The Doctor decides to kill Davros. Both Davison’s and Davros’ (Terry Molloy) performances are truthful to the emotions they are playing in this scene. Davros goads The Doctor into doing it, knowing he never will and then perceiving that he is weak for not doing so. The Doctor’s struggle throughout the story is whether to kill one person for the greater good of others. The debate of what is the greater good also runs through the story as Tegan leaves The Doctor’s side because she is disheartened by all the pointless death which does not help anyone but harms the people involved. Resurrection of The Daleks is a dark, deathly story which plays with the ideas of good and evil and what is the point of self-sacrifice in war, ideas that are still very current today.